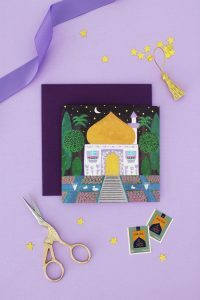 Flying Carpet Game – Hello Holy Days! This flying carpet game is fun for kids of all ages (in fact even grownups will have a great time with this one!) As a non-competitive and active game, it’s especially great for small children like toddler and preschoolers. Be sure to play in a large indoor room with furniture moved out of the way. For this game you will need one kleenex, a marker and scissors. Cut up your kleenex in half and fringe the edges with scissors to resemble a prayer rug. Use a black marker to draw a mihrab (arch) on the two prayer rugs, making sure the marker seeps all the way through the kleenex. Separate the ply layers; typically kleenex have 3 ply layers which will result in 6 flying carpets for 6 players. 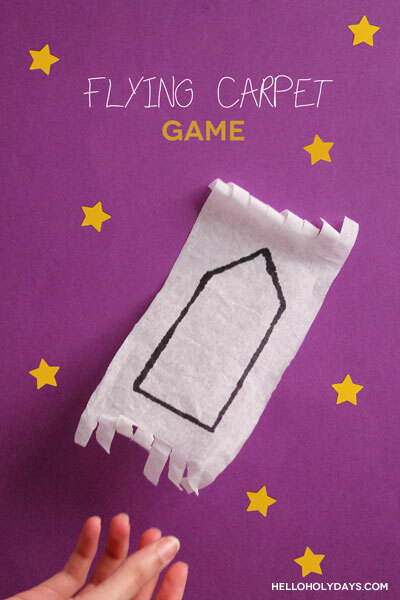 The objective of this game is to keep the kleenex in the air – try not to let it touch the ground! Dangle the kleenex from one end in front of your mouth and blow as hard as you can to get the carpet flying. Once it’s flying, try to keep it in the air by tossing it up with your hand every time it’s close to touching the ground. If it touches the ground, just get it flying again by dangling it in front of your mouth and blowing hard. Keep on going until your sides hurt from laughing so much! If you’re planning to have this game for a children’s party, build in about 15 minutes of play time for it.